If you persist in pushing through the more tangible and readily apparent forms of zen, at least those successfully marketed in the West [sitting posture, breathing, a commodified aesthetic familiar in the West as watery wabi-sabi], you occasionally come upon extraordinary articulations of what it means to improvise. The best teachers, in fact, are not preparing you for interminable hours of remaining seated on a cushion, but for improvising. If you persist in sifting through the often hermeneutic and, consciously or unconsciously, obscure ramblings of improvisers discussing what they do, you come upon articulations of the pith and gist of zen. “I studied under a Buddhist monk called Sangharakshita, I studied form, perception, meditation. What I wanted to be able to do was look at something and understand it, or to be able to understand the relation, the tension between these two things (searches around for objects on the café table), between the corner of this [ashtray] and that round thing [the back of the chair].. I wanted to be able to walk into a space and immediately comprehend what the space was about. Meticulous attention, immediacy, responsiveness, interrelationship, “what the space is about”-improvisation. This is the intersection of where I spend a great deal of time and place my attention. Charlotte Joko Beck is quoted from Everyday Zen, 1988. Keith Rowe is quoted from a Paris Transatlantic interview, January 2001. 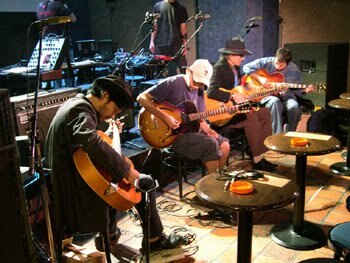 The picture is of Taku Sugimoto’s Guitar Quartet during soundcheck at the Amplify 2002 festival; I chose it as it reminds me of one of my early experiences of watching improvising musicians in a new area of music collectively sharing that meticulous attention to the anatomy of the present moment. This entry was posted in music writing on May 17, 2010 by jessewgoin.